2019 Apple Festivals in Illinois - Where, When and More to Find an Apple Festival Near You! Looking for a apple festival in Illinois in 2019? (just scroll down the page)There is no other listing as complete and current as this list, just updated! 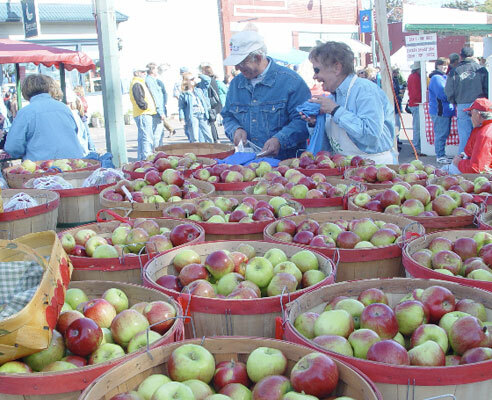 All the apple festivals in Illinois we can find are listed on this page! If you love strawberries, look for a festival near you below! And I'm always looking for more apple festivals! Please write me, if you know of any to add! I update the dates as soon as the festivals publish their information, but you can always click on the links (usually the name of the festival) to see the current information on the festival's own website. Holstein Park 2200 N. Oakley Ave., Chicago, IL 60647. Phone: 773-353-5003. Alternate Phone: 773-230-3758. Fax: 312-698-8668. Email: [email protected]. Open: October 16, 2011 2:00pm to 5:00pm. Directions: Click here for a map and directions. Payment: Cash, Visa/MasterCard. Click here for our Facebook page. Amateur bakers and pastry pros will be out in force on Sunday, October 16, 2011 as they compete for the coveted blue ribbon in the 7th Annual Bucktown Apple Pie Contest, a fundraising event that benefits Holstein Park. In the Park's historic field house and grounds, a panel of chefs, restaurateurs, gourmands and local celebrities will judge 150 apple pies, looking for the ultimate combination of appearance, taste and texture. The event also includes live music, kids' activities, a silent auction and a raffle. $2 / $5 donation requested for entrance. Contestants pay $15 to enter a pie for judging. Long Grove Apple Festival - hours are 10 AM to 6 PM daily. Long Grove, IL. Admission is FREE and so is the parking (There is a charge at the Church parking lot). Long Grove restaurants, such as the Apple Haus and outdoor food booths serve apple pies (4,000 were sold last year), apple cider, and apple muffins, apple cinnamon pretzels, apple salsa, and taffy apple beer mug sundaes.